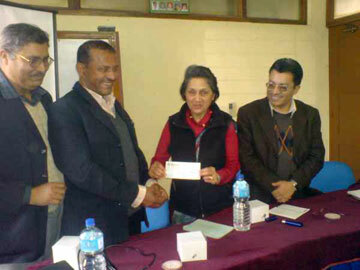 SAF-Nepal Chairperson Dr. Rita Thapa on Feb. 22, 2009 handed over the budget to Dr. Devi Prasad Ghimire, Vice-Chairman of the CTEVT for the implementation of 40 SAF-Madanjeet Singh scholarships to Jiri Technical School at a function held in Kathmandu. 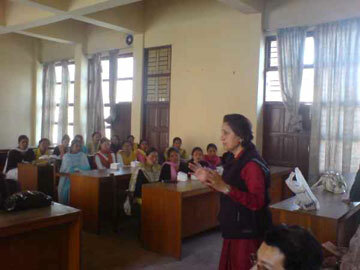 The Jiri Technical School which is part of the CTEVT together with Himalayan Health and Education and Madan Bhandary Memorial College will this year implement altogether 84 scholarships for ANM training being provided to girls selected from janjaati and dalit communities from 19 poorest districts of Nepal. The program is also being partly supported by the Poverty Alleviation Fund (PAF) of the Nepal government. Speaking on the occasion Dr. Rita Thapa remarked that some people were skeptical of the practicality of this program when it was first initiated due to the on-going conflict in rural Nepal but now with the hard work, honesty and win-win partnership model, the scheme has not only been very successful but also proven to have a catalytic effect and a model show-case for others to see and take lessons from. After the handing over ceremony, an interaction program was organized with the old batch of 40 students who are passing out from the 18 month long course. Becoming emotional upon seeing the happy faces of the students, Dr. Thapa asked them on their future career plans. All the students said that they were immensely grateful to SAF Founder Ambassador Madanjeet Singh for his generous contribution as a result of which they have now become skilled birth attendants.